In 1973 the Chilean military overthrew the democratically-elected president Salvador Allende in the September 11 coup. Tanks stormed the presidential palace in the heart of downtown; Air Force jets bombed the capitol. In the end, Allende was found holding a submachine gun, with which it’s generally believed that he committed suicide, but not until after he addressed the country by radio in a moving speech. “I have faith in Chile and in its destiny,” Allende said. “You must go on, safe in the knowledge that sooner rather than later, the great avenues will open once more, and free men will march along them to create a better society.” In the following days Augusto Pinochet arose as the leading member of the military junta that orchestrated the coup. He became the dictator of Chile, a position that he occupied in some form or another for more than 15 years. If you visit downtown Santiago, you can still see some marks of that historic day. The presidential palace, La Moneda, lies on the main downtown throughfare, La Alemeda. If you stand with the back side of La Moneda at your back, looking across La Alemeda, you will see a row of flags across the street flanked by fountains. Behind the right-most flags is a tall building. Looking at the top-left window, find the window in the fifth column from the left and the fifth row from the top. Once you’ve found that window, look to the left at the space between the windows. 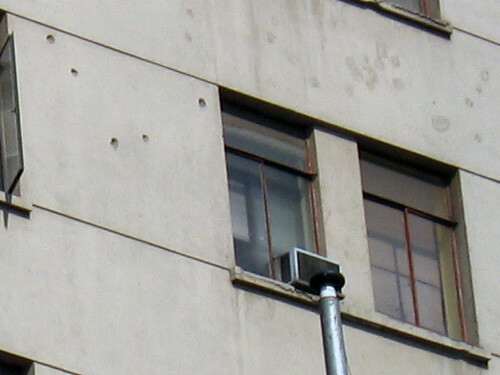 You’ll see five holes in the concrete: bullet pockmarks from the time of the coup. There are many scars from the era of Chile’s dictator, but most are invisible, carried by the people who lived through those years; this is one of the few you can see. I couldn’t find any mention of this in guidebooks that I checked, but a number of Chileans assure me that it’s true. Consider it a little tourist tip. Hard work will get you a professorship or a BMW. You need both work and luck for a Booker, a Nobel or a private jet.